Rival to the BMW X6 and Mercedes-Benz GLE Coupe. More expensive than the Cayenne. On sale May 2019. Initially available with two engines: the standard 340PS Cayenne Coupe, priced from £62,129, and the 550PS Cayenne Turbo Coupe starting at £104,729. There's enough room for four people as standard, with eight-way adjustable sports seats in the front. There's a rear bench fitted as standard, or customers can opt for comfort rear seats at no extra cost. Rear passengers sit 30mm lower than in the Cayenne meaning there's plenty of headroom, despite the coupe roof. The boot capacity is 625 litres, rising to 1540 litres with the rear seats dropped. The standard model uses a six-cylinder 3.0-litre turbocharged petrol engine with 450Nm of torque available. This covers 0-62mph in 6.0 seconds, or 5.9 seconds with the optional lightweight sports package. The Turbo uses a 4.0-litre twin-turbocharged V8 with a hefty 770Nm of torque. It reaches 62mph in 3.9 seconds. The Cayenne Coupe features an extending rear spoiler, a large panoramic sunroof and an optional carbon roof. 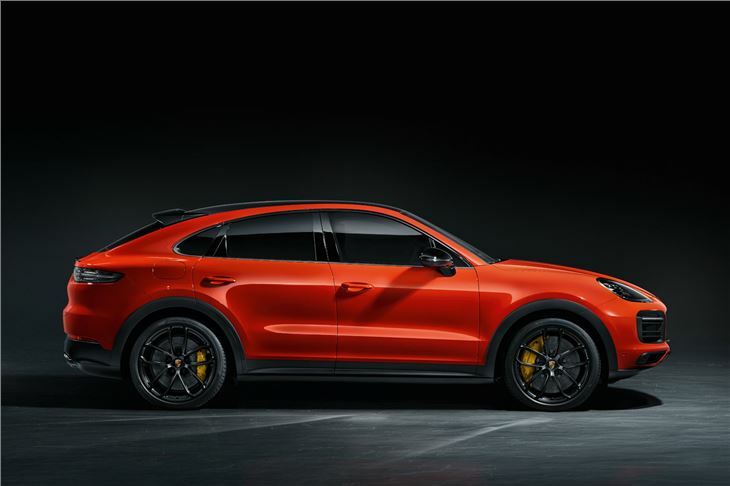 Standard equipment includes speed-sensitive Power Steering Plus, 20-inch alloy wheels, Park Assist at the front and rear including reversing camera, Porsche Active Suspension Management (PASM), and the Sport Chrono Package.